BURLINGTON, IA (August 22, 2018) As school resumes and classrooms fill with students this week, there is a new addition to the landscape of the Burlington Notre Dame campus. West Burlington’s Precision Energy Services recently completed the installation of 836 solar panels on the east side of the Nike’s soccer complex alongside Terrace Drive in Burlington. The 276kW photovoltaic system will harvest energy from the sun creating enough electricity estimated to offset nearly 95% of the school’s power consumption and will save the school bundles of money on electric bills for the next 30 years. One of the more attractive benefits of adding solar to the school was the creation of a “Power Purchase Agreement” initiated by Precision Energy Services and Red Lion Renewables from Norwalk, Iowa. A solar PPA is an innovative financial structure which eliminates the largest barrier to a school from going solar – the access to upfront capital. Precision and Red Lion connected Notre Dame with a private Limited Liability Company which took advantage of state and federal tax programs not available to nonprofits. "We design, install, operate and maintain the system, while the school agrees to site the panels on their campus. Notre Dame then purchases the system's electric output from the LLC instead of from Alliant,” explained Precision Energy Services owner, John Fruehling. "Most schools are nonprofit institutions, so they are unable to take advantage of solar tax breaks. As a result, the majority of school installations tend to use PPA options to finance their renewable systems. 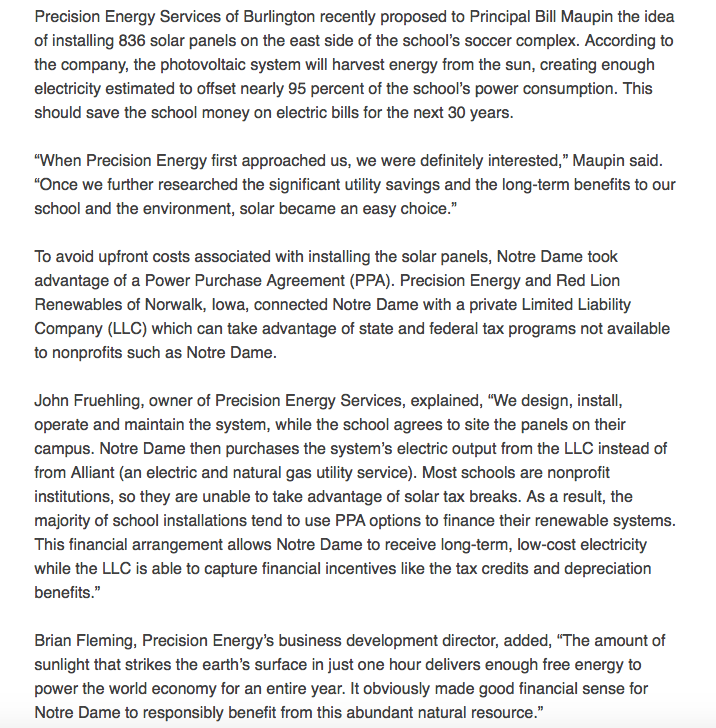 This financial arrangement allows Notre Dame to receive long-term, low-cost electricity, while the LLC is able to capture financial incentives like the tax credits and depreciation benefits.” Brian Fleming, Precision’s Business Development Director added, “The amount of sunlight that strikes the earth’s surface in just one hour delivers enough free energy to power the world economy for an entire year. It obviously made good financial sense for Notre Dame to responsibly benefit from this abundant natural resource." Father Marty Goetz serves on the Notre Dame School Board as Pastor of Des Moines County's Divine Mercy Parish. He and his fellow board members fully supported the project and it’s purpose. "Pope Francis has called us to be good stewards of creation. 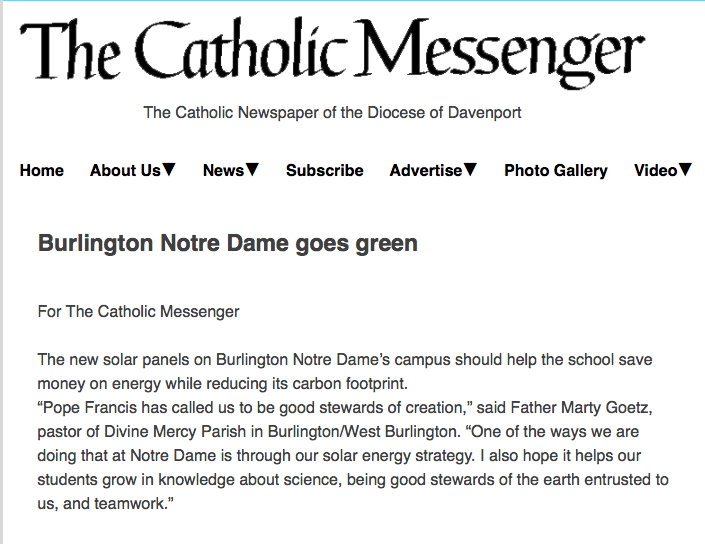 One of the ways we are doing that at Notre Dame is through our solar energy strategy. 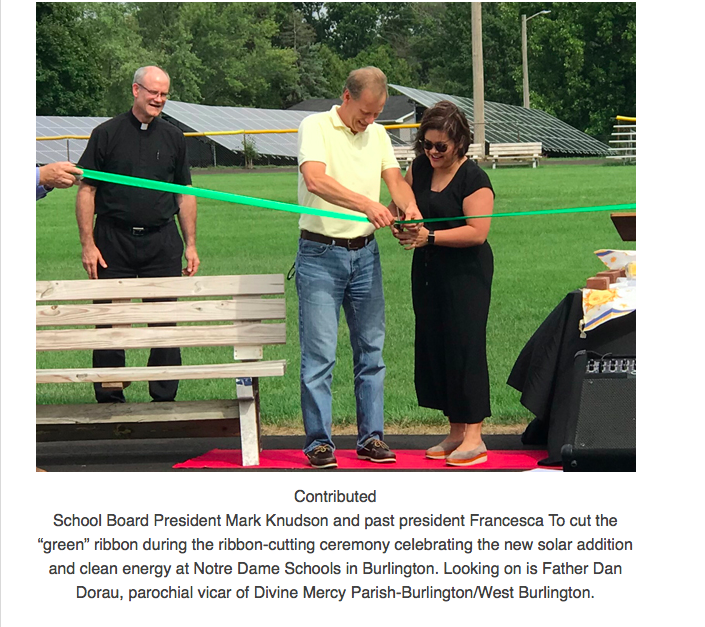 I also hope it helps our students grow in knowledge about science, being good stewards of the earth entrusted to us and teamwork.” In addition to the endorsement from the school board, the Notre Dame Business Office and the Diocese of Davenport were diligent in examining the project prior to approving it. “We wanted to be absolutely confident that a project of this size and scope was viewed and evaluated from all perspectives and by all appropriate governing parties before moving forward,” said Deb Trine, Notre Dame Business Manager. Maupin cited several other cost-cutting measures that have been taken at the school recently in addition to the new solar arrays. “This system will produce almost 95% of our electricity for the next 25-30 years. 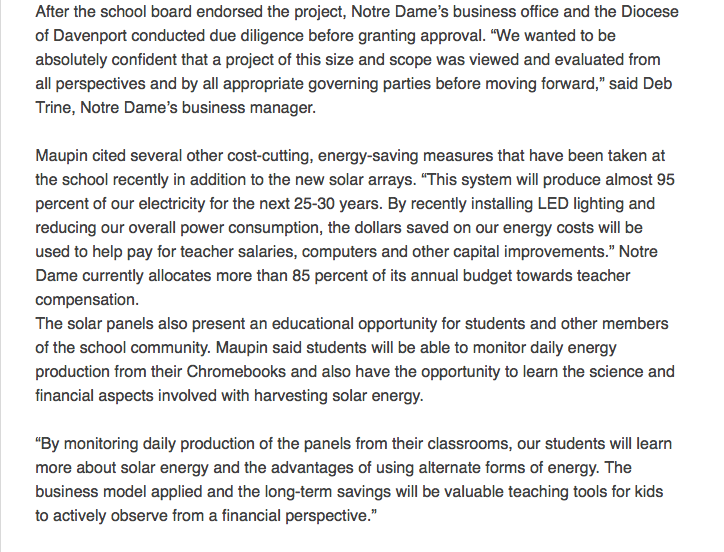 By recently installing LED lighting and reducing our overall power consumption, the dollars saved on our energy costs will be used to help pay for teacher salaries, computers and other capital improvements.” Notre Dame currently allocates over 85% of its annual budget towards teacher compensation. The school will eventually be provided the option to purchase the solar system for a fraction of the initial project cost. Fruehling pointed out the school benefits from this arrangement in many ways. “There is no money down or upfront capital expenditure for the school. The rate of power is predetermined and predictable, unlike most utilities who are consistently raising their rates. This project can be cash-flow positive from day one and the LLC assumes all operational and maintenance risk.” The solar panel installation will result in near elimination of future electricity bills by reducing usage and increasing their own production. Nike students were able to accrue Silver Cord hours awarded for community service during the system installation. Several additional students will likely utilize the school solar system as part of future STEM projects. STEM is a curriculum focused on four specific disciplines which include science, technology, engineering and mathematics. A recent Solar Foundation report found that the average price of a solar school installation has dropped 67 percent in the last 10 years, and 19 percent in 2016 alone. There are nearly 6,000 K-12 schools in the United States that use solar energy, with a combined capacity of 910 megawatts — nearly double the total solar capacity installed at schools in 2014. Friday, August 31, 2018 at 2:30pm. Parents, faculty, staff, students, alumni and the public are invited to attend. Precision Energy Services is a division of Precision Companies, Inc. and has been installing solar on businesses, residences, schools and farms since 2012. Precision Energy Services is committed to providing outstanding service, forward-thinking design and the highest quality of construction available in the solar industry today.